The United Arab Emirates (UAE) is a tiny collection of cities located on the southern edge of the Persian Gulf. Despite its tiny size, this country has enormous oil wealth, which means they have one of the world’s most biggest markets for supercars and exotics. And that is why this year’s Ferrari Tour UAE turned out a greater event than any of the European editions. On the Ferrari Tour UAE 2018, held earlier this month, a group of 13 Ferrari GT cars went on a three-day driving event. They started in Dubai and during the 650 km drive visited the country’s most beautiful roads and places. Granted, 650 km is not that long a drive, and yes they kinda went up to Ras Al Khaimah and then sort of turned around and headed the other way to Abu Dhabi. But in diong so they created some spectacular scenes, mainly thanks to the presence of Ferrari’s handsome new boy, the Portofino. 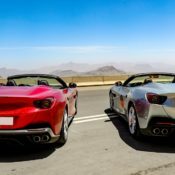 The post Highlights from Ferrari Tour UAE 2018 appeared first on Motorward.